Recently i had read 'The Help' by Kathryn Stockett. I had been saving the book to read on vacation, but then the movie came out and i wanted to have it read before viewing. You know, it's always perfectly nice to ruin a good film by having read the book first, right?? LOL That left me on the hunt for a new book. In this post, i asked for some book offerings from my readers. LOTS of you had suggestions, making the decision not an easy one. Thanks! DaddyO and i had been watching 'The Tudors' on Netflix over the last few months. The Shakespearean in me was surprised that Henry VIII was Elizabeth I's father and even more surprised that Anne Boleyn was her mother! I'm not quite sure how i missed those facts? Since Elizabeth I was third in line and technically, never should have ascended the throne, i was intrigued about her siblings who came before her. Edward VI wasn't all that exciting. He ruled for 6 years, from ages 6-12. Then there was Mary- whose reigned became known as the reign of Bloody Mary. I decided to skip the book that was specifically about her, as her reign was a little too blood and gore for me (and we thought Henry VIII was bad?). 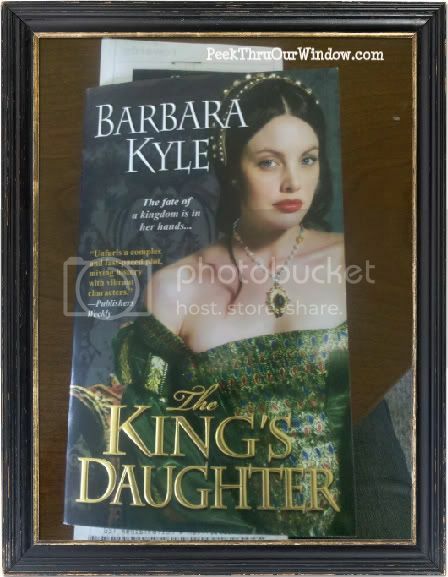 The book i chose, "The King's Daughter" by Barbara Kyle, focusses on the end of Mary's reign... and the uprisings and schemings it takes for Elizabeth I to enter power. Let's hope i chose well!